Two surgeons performing the same operation at a given hospital will most certainly have individual preferences that differ based on technical operative steps, instruments, equipment and medications required for the case. If surgical staffing and human resource constraints were smaller and less complex, consistent teams could be formed, and any problems arising from this variability would be alleviated via team experience and subsequent familiarity. However, consistent teams are simply impractical, particularly at large academic and community hospitals. Although nurses are very well-trained and experienced, the the preferences of individual surgeons are very difficult to keep track of in the absence of a comprehensive and interactive technological solution. Delays and disruptions due to missing instruments and supplies are commonplace in surgery, and this is directly related to the lack of a clear and up-to-date guide to a given surgeon’s preferences. ExplORer was built to solve this problem, one which our clinician co-founder, Dr. Alex Langerman (an ENT surgeon and leading OR efficiency researcher), faced every day in his own operating room. Additionally, when the surgical case needs are unknown, the tendency is to open more instruments and equipment in an effort to provide for any possible needs. This is an inefficient strategy that leads to longer setup times and a substantial amount of waste (anything opened in the operating room needs to be discarded or resterilized); what’s even is the “open everything” strategy still does not guarantee that the needed supplies will be among the mass of materials that were opened. This misalignment of surgeon and case needs and staff activity is a pain point for both surgeons and nurses, and ExplORer directly addresses these overlapping team needs. Furthermore, by more accurately aligning surgeon preferences with operating room setup, we save hospitals money by decreasing OR time per case and preventing wasted supplies. More accurate setup and decreased delays can also lead to greater OR throughput, which may increase revenue for hospitals with high surgical demand. Surgeons’ preferences and what tools and supplies are used in which step of which cases is a treasure trove of data that can be leveraged for hospital clients as well as surgical device manufacturers and purchasing organizations. Knowing how surgeons perform procedures (which step in which order) has potential public health and surgical education applications. Additionally, the very act of using ExplORer during surgical cases generates granular data on procedure progress that can be used to streamline OR management and can fuel predictive analytics on surgical activity (e.g., anticipating when a surgical case will end so next steps can be planned). Currently, there is no commonly-used technology to capture this intraoperative data. ExplORer, a web-based, Software-as-a-Service (SaaS) workflow management application, is an interactive surgical playbook that promotes optimal teamwork in the operating room. 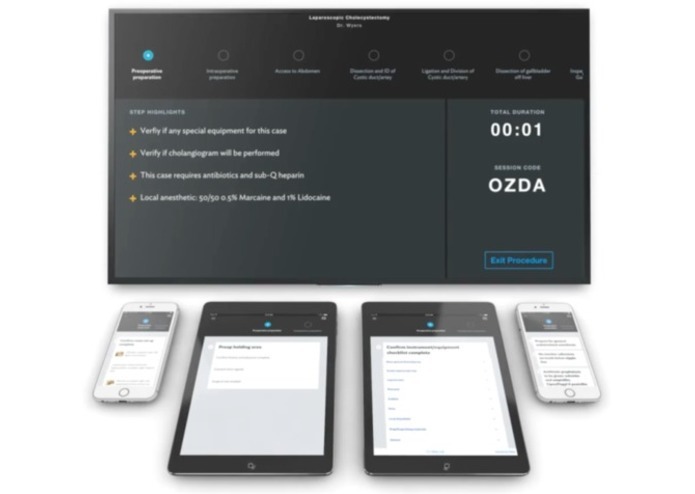 Best practices are built into a customized workflow for each case. Step-by-step instructions and diagrams help surgical team members follow along with the case and prepare for what's coming next; in doing so, we help deter delays and disruptions that can occur from missing or incorrect tools. We also aim to reduce the waste of disposable tools that are opened but go unused – a major component of the billions of dollars of surgical supply waste that occurs annually in the United States. Additionally, variability in cost has a negative impact on patient outcomes. The analytics component of our software allows hospital administrators to track surgical activities and costs to better manage their ORs and gain new insights for operational efficiency. ExplORer was built with MEAN stack (Angular.js, Express.js, Node.js, and Mongo DB), using Socket.io. The application is hosted on AWS with multiple EC2 application servers running Ubuntu OS. We also use HAProxy load balancers. 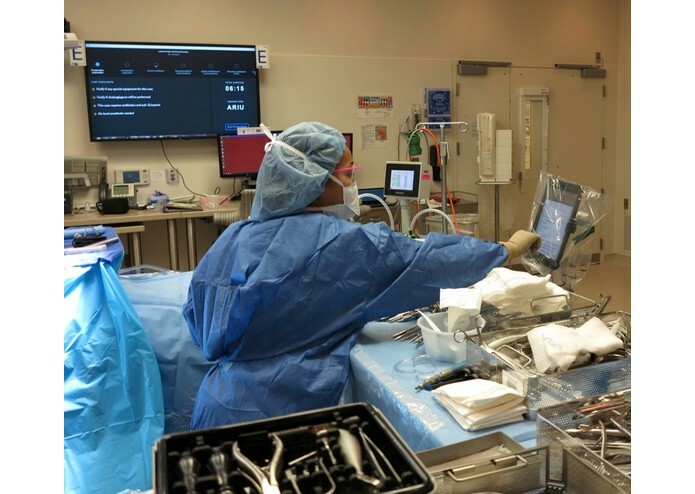 We needed to have instantaneous synchronization of information between multiple team members in the Operating Room with separate browser sessions. We solved it with the use of WebSockets. We have built three generations of our program and currently have a commercial version of our software. Our preliminary pilot results show that with the use of ExplORer versus the baseline, setup time was reduced by 10%, tool-related disruptions were reduced by 42%, and cost of the case due to wasted items was reduced by 5%. These results can be directly linked to team satisfaction and reduction in operating room time. These results suggest millions of dollars in annual savings potential, not just for large academic and community hospitals but even for smaller hospitals, simply by using our product. The potential for cost savings is heightened even further once we receive our next round of funding and are able to build out an aggregate data analytics dashboard for stakeholders to view the granular data that ExplORer collects during live surgical cases. As we prepare to make our first sales into hospitals, this dashboard delivers an integral aspect of ExplORer’s key value propositions. We have received several awards. We won $50,000 through the Pritzker Group Venture Fellows Program, were awarded 2nd place at The University of Chicago Booth School of Business’ New Venture Challenge, named one of four finalists in the Cleveland Clinic Innovations’ New Ventures Healthcare Challenge, and named one of the 150 Nominees for Chicago Inno's 50 on Fire competition. We have been funded by a Phase 1 and Phase 1B Small Business Technology Transfer Program (STTR) grant from the National Science Foundation. Lastly, in September 2016, we closed a $1 million seed round including 4 funds as well as prominent healthcare and technology angel investors. We currently have a commercial version of our software in use at five hospital systems around the country. I am a seasoned technology executive, an expert in agile and lean start­up methodologies, with more than 15 years of experience.